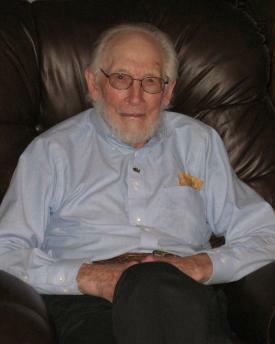 John Russell Bell, age 95 of Richwood died early Tuesday morning, February 14, 2012 at Marion General Hospital. He was born April 15, 1916 in Leesburg Township to the late R. Fay and Caroline (Laird) Bell. On March 25, 1944 he married the former Lydia Woleslagel in the home of her parents outside of Prospect and she died January 9, 2010. He was also preceded in death by an infant son, Charles Richard Bell, a brother, Richard Bell and a brother-in-law, Truce Clime Woleslagel . A graduate of Richwood High School, he was a life-long farmer and fisherman. John owned a motor home and loved to travel all over the nation, and attended President Reagan’s inauguration in 1981. A 75-year member of Mt. Carmel Lodge #303 Free and Accepted Masons in Richwood, he was very active in Freemasonry and its satellite organizations, having been Past Master of the lodge in 1944 and 1994, a 65-year member of the Order of the Eastern Star in Mary Chapter 9 and the former Mt. Carmel Chapter 42 in Richwood where he and his wife, Lydia served as Worthy Matron and Patron. John was High Priest of Marysville Chapter of Royal Arch Masons #89 in 1951 and Illustrious Master of Marysville Council of Royal and Select Masons #98 in 1954. He was a 60-year member of Valley of Columbus Ancient and Accepted Scottish Rite where he had served as Ambassador, a 60-year member of Marion Commandry #36 and 50-year member of Aladdin Shrine. John was a Claibourne Township trustee for 12 years and was Past Chairman of the Union County Trustees and Clerks. He was a Republican Central Committeeman for over 50 years, Chairman of the Union County Republican Party, Claibourne Grange, former State Grange Deputy and Youth Chairman, member of Claibourne United Methodist Church where he taught Sunday School for 12 years. He served on the Richwood Fair Board for 40 years, served on the Auxiliary Sheriff Department in Union County and was a past member of the Union County Board of Elections. He is survived by five children, John Ed (Linda) Bell, Richwood; Bonnie Bell, Richwood; Caroline (Bill) Lucas, Prospect; Joe Bell, Richwood, Mary (Rich Cappell) Snider, Marysville; seven grandchildren, John Willis Jr., Miranda (Jason) Swartz, Dannette Lucas, Andrea (Chris) Zeno, Dawn (Coury) Lucas-Carlson, Jameison (Holly) Snider, Katherine (Russell) Weymouth; four great-grandchildren, Caitlyn Laney, Heather Swartz, Joel Zeno and Henri Zeno. Services will be Saturday, February 18, 2012 at 2:30 PM in the Mt. Carmel Lodge, 131 North Franklin Street, Richwood, beginning with an Order of the Eastern Star Service conducted by Mary Chapter 9, followed by a Masonic Service conducted by Mt. Carmel Lodge #303, and concluding with a Celebration of Life officiated by Pastor Steve Brown. Friends may call beginning at noon on Saturday at the lodge prior to the services. Private family graveside services will take place at a later date in the Claibourne Cemetery. Memorial gifts may be made to the 32nd degree Masonic Learning Center, 290 Cramer Creek Court, Dublin, OH 43017. So Sorry to hear about the loss of John R .
Caroline and all the rest of the Bell family~ Sorry to hear about John's death. He was a good citizen and a good neighbor. He certainly had a rich, full life. I know that you will all miss him and I'll be praying for you. As a brother Mason, John always spoke kindly to me and offered good advice. His kindness will never be forgotten. A man like him is indeed a rarity. Sending hugs and prayers to you all. Sor sorry to hear of your fathers passing. I know you have many good memories . Thinking of you . Just wanted to extend to to your family our sincere sympathy. We can't think of John without also thinking of Lydia. We enjoyed many Masonic and Eastern Star events with them and recall their dedication to these orders and to each other. They have left a wonderful family, to carry on their legacy. Truely sorry to hear of the loss of John Russell. You are all in my thoughts and prayers. Just wanted to let you know that Dianne and I sorry for your loss. John R. was really well liked and respected in the Lodge and we will never be able to replace him. I know everyone is praying for you. Wish we could be there for the services to honor John R. but we can't get back in time. Your dad and mom and my dad and mom are from a special generation in American history and I praise the Lord for the them, almost 100 years of core American history. I have not forgetten the summer time I had the opportunity to be with you all on the farm, baling hay and eating corn and just living the good tough life....a story to be told again and again. Thank you to John and Lydia for those memories. As I go forward I remember you both. So sorry for your loss, John was getting real tired and ready to reunite with your Mother and Family. As my Dad said, Living this long,most of your Family and Friends are already gone. May your faith in our Lord bring you comfort in the days ahead. It was a privilege to meet John Russell last summer and to get acquainted with all of you who extended such gacious hospitality and invited us in. Please accept my sincere sympathy for your loss. I hope John Russell's positive impact on your family continues well beyond his passing. I was sorry to hear of the loss of your father. Your father was a kind, trusting man. He was a friendly and caring neighbor to us for many years. Your father ran, with great endurance, the race God set before him. He was always ready to lend a helping hand or speek a kind word. The light of God clearly shone through him as he went about his daily activities. John will be dearly missed not only in our small community, but far beyond our boundries as well. May God blanket you with His comfort and peace today and also in the days and weeks ahead. So sorry to hear about the passing of John. We are grateful to have gotten the chance to meet him last spring and enjoy his company and reminiscing of the days from my mother's (Karen Roof) childhood. I know he will be greatly missed. Your father was such a great person. We will certainly miss him at the Mary Chapter meetings. I hope you know what a fine person he was. You have my sincerest sympathies. My thoughts and prayers are with the family. May you find comfort in the many memories you shared. #22 from: Mrs. Edward Core, Jr. I was so sorry to hear about John. I have many good childhood memories of our family coming down to the farm and visiting. My dad, Don Langstaff, was very close to his cousin John and he will be greatly missed. It is sad that they are both gone now and I hope your memories of John will help ease your sadness. To the entire family I extend my sympathy, I have been out of town and only today learned of your loss. I have many good memories of your parents, they were truly part of a great generation. Mary & family - Just found out about your Dad's passing. Our prayers & sympathy are with you. John had a full life! I have numerous memories of all the years (and boy were there a lot) I spent at your house with your family -- trying to get me to drink coffee; living on the farm; many sleepovers; lots of fun! Always felt like part of the family! Know that I'm thinking of you!